My family has never been a huge fan of the Harry Potter series - the books or movies. Yet, the big man in red (aka Santa) deemed Sony's PlayStation Move exclusive title, Wonderbook: Book of Spells to be a present appropriate for my 6 and 8 year old daughters this year. While I may have gone in a skeptic, I came out a believer. Loosely based on the world created by J.K. Rowling, Book of Spells resembles the Harry Potter universe in the sense that the gameplay is filled with magic and wizardry, while the story is fantasy-based from start to finish. Although the game only accommodates for a single player experience, my daughters were interested enough to takes turns from one chapter to the next. Utilizing the PlayStation Eye camera and Move controller, Book of Spells comes packaged with the game disc and said book - a hardcover whose pages replace words and chapters with largely printed QR codes often found on Augmented Reality cards. After selecting a wand of choice from 3 different options, the move controller is quickly and effectively replaced with your on-screen wizard's tool. By pointing your new wand at the various pages when instructed to do so the AR codes are transformed by the Eye as images on the TV and your adventure begins. Interactive puppet-style story telling provide the historical origins of the individual spells that you set out to learn the incantations and wand waving techniques for. Book of Spells is smart enough to allow the player to skip these stories but my girls were enjoying the total experience that they never did and I would recommend you follow in their tiny, but wise, footsteps. Each back story was short and entertaining, and the pop-up-book augmented reality was always a treat to behold as it came to life on the TV. After each spell is discovered and learned - there were roughly 20 in all and range from levitation and fire to freeze and shield - you are given the opportunity to test your new skills before confronting the final trial of each chapter. Considering there are 5 chapters in all, each test challenges the player to remember the individual wand movements (roughly 4 per chapter). While this may not seem like much to those comfortable with the PS3 it was somewhat challenging for my 6 and 8 year olds. As a result, I discovered very early on that drawing the wand movement shapes on a separate piece of paper was all they really needed to successfully complete each chapter's test. I consider this to be a missed opportunity from the developers. Although the game may provide hints for each wand movement, a quick reference guide would have been better. Where the history of each spell is told through a puppet show, the actual spell casting trials are represented on screen in an even bigger and more fantastic way. The PlayStation Eye camera does a nice job of displaying the player on screen; it does an even more impressive job of placing the player into a variety of fantasy settings to perform their newly learned spell. I've played a number of PlayStation Move games with my children in the past that use this same camera functionality and Book of Spells is hands down the best to date. The video is generally clean and clear - not High Definition by any stretch of the imagination- and did a good job overall. Each chapter's conclusion provides a piece to an overarching story that nicely comes together by the game's end. When completed, Book of Spells summarizes all the qualities that make a wizard great - patience, hard work, bravery, good will, etc. This was a nice touch as it enforces similar qualities that a parent is always trying to teach to their children in everyday life. Wonderbook: Book of Spells is not a long game. Each chapter takes approximately an hour to complete, if you watch the interactive stories. My girls and I were able to finish it in 2 sittings and were enthralled from start to finish. I lent a helping hand when needed but they were mostly capable of managing the spells and challenges on their own. 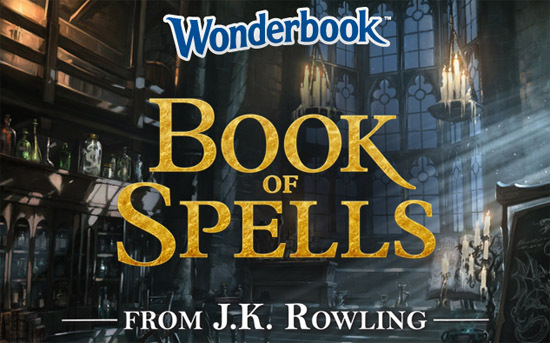 Although I couldn't recommend Book of Spells for most adult gamers who are not Harry Potter fanatics, I wholeheartedly recommend this game for children and parents to play together. The controls worked exceptionally well, the visuals were better than I was expecting, the story was entertaining, and the AR functionality was flawless. Where my girls believed themselves to be wizards in training I treasured the wonder (pun intended) in their eyes, and we're all looking forward to Sony's next Wonderbook offering.